I have a small confession: I was at book club tonight and when I came home hubs had made this with the kids and even took pics. I can't decide if he's being super sweet or up to something. Hmm... Either way he has scored some serious points. This is definitely a favorite around here. Easy enough for the kids to pretty much make themselves. And when rain is forecasted for a week straight, this is the next best thing. Spray 13x9 pan with the cooking spray. 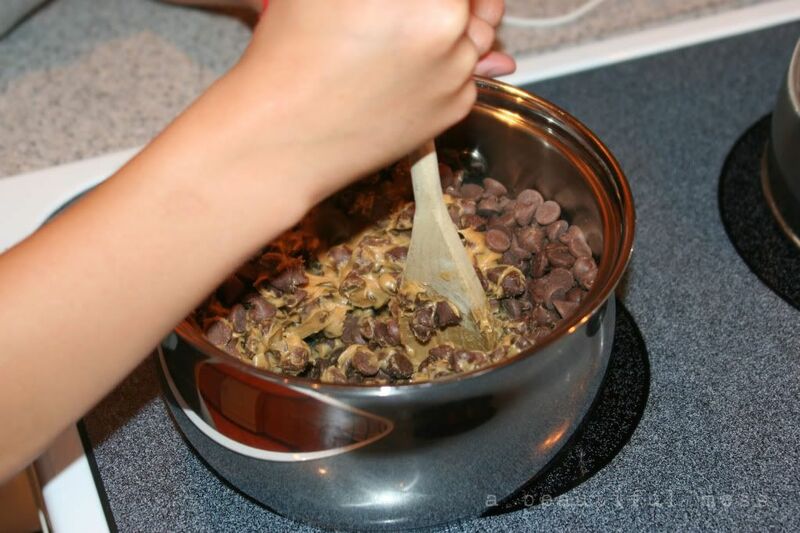 Put chocolate chips and peanut butter in a saucepan. 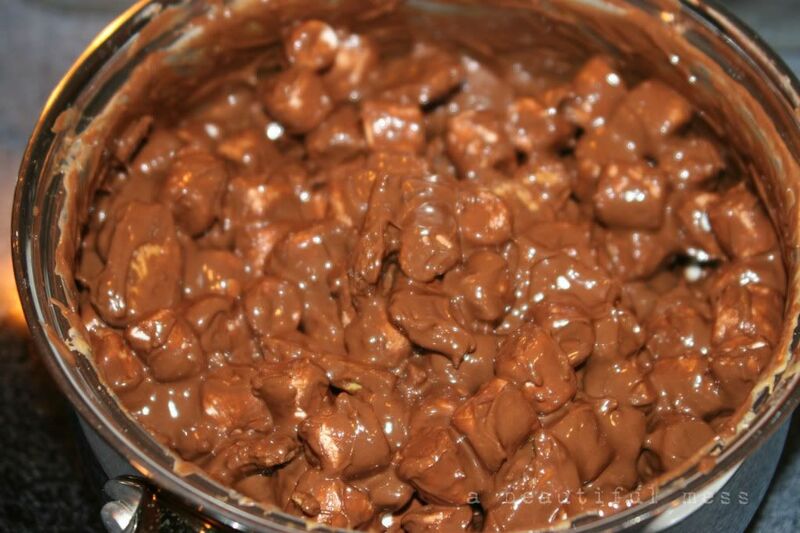 Cook over low heat, stirring constantly until the chocolate chips are melted. Take saucepan off heat. Crush up graham crackers in a plastic bag. 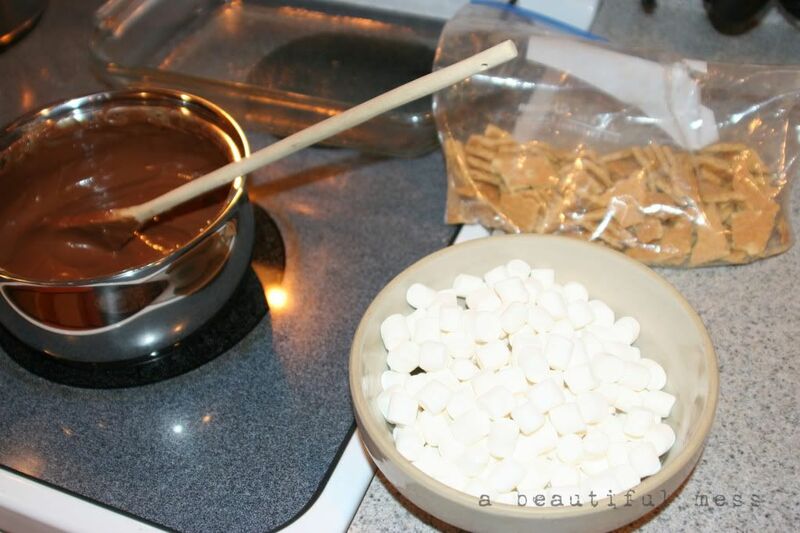 Stir in graham cracker pieces and marshmallows. Spread the mixture in the sprayed pan. Put pan in refrigerator for about 1 hour or until firm. Cut bars. Voila! Enjoy some indoor smores. Grab one of your family favs and join the bloghop party. You can grab the button to the right. Can't wait to see what you come up with. I came back to post my Summer Grilled Pizza! That looks so good, and I'm sure my daughter would love this. 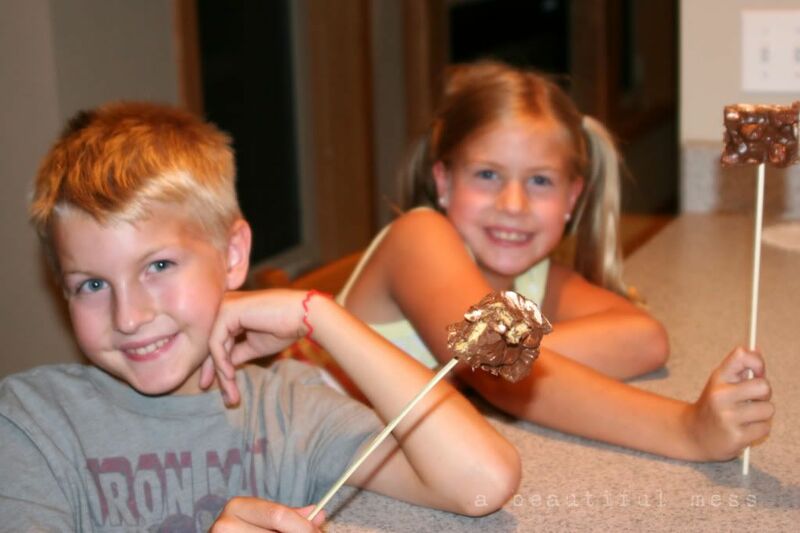 We make our indoor smores a bit differently but this sure is more fun!!! Oh my gosh, my kids are going to LOVE that....It's been so hot and icky here we've been doing lots of inside stuff....and I can't ever imagine a scenario where a campfire would be involved. Must go to the store today. Thanks for the recipe! Oh, those look yummy! Were there any left for you to try? I absolutely LOVE that idea! So fun...and easier! I'm sharing Asian Snack Mix...it's a slow cooker recipe...simple! I think our hubbies are on a roll! I came home to mine cleaning the house, but not just cleaning, moving furniture, vacuuming, and dusting kind of cleaning. They can be so great sometimes!!! These look awesome. I totally am craving them now. Oh the peanut butter and chocolate. My mouth is watering! Way to go, hubs!!! We made similar smores. I crushed the graham crackers and we rolled the marshmallow in the chocolate and then the crackers. Delish. Anything with chocolate and peanut butter gets an A+ in my book. Those look awesome! I can't wait to give them a try! We just made s'mores the other night, on the firepit though. Even my teenagers will love these! What a great idea and I can't believe you husband and kids took pictures while you weren't home. What a perfect blog. Wow...what a cool husband. You must be doing something right for him to think of you like this. I'm doing the blog hop for the first time! I didn't add a "family fav", but a recipe that I'm sure will soon become one! YUM! I've been on a s'mores kick lately and these look delicious! We'll be making these for sure! Yumm! Those look so good! I just linked up! Uh...and not only do you have a thoughtful husband, but he's great at entertaining the kids and he knows his way around the kitchen. Lucky you! I purposely posted a recipe today to link up with you. 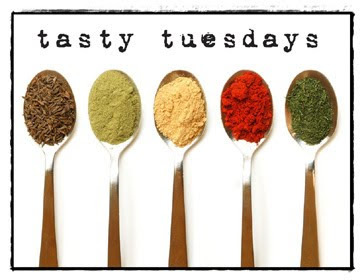 :) Have a Happy Tasty Tuesday. YUM! Sounds fantastic! I don't have a recipe to share today but I came her to find the link to refer another food blogger than I found and stayed to listen to the music! :) Life has been busy lately so I'm behind on my blog visiting. Sorry! These look awesome! I love the addition of peanut butter, and my mouth is watering right now...can't wait to try them! I'm thinking that, while hubby may have been sweet, the treat was the main goal in doing these while you were gone?? Mmmmm, looks tasty! What a great idea! Looks Yummy. i like how there is peanut butter in the mix as well. these look delish! And easy, too. I have some marshmallows laying around that I never use. I'll have to try it! Wow! Those look delicious, I can't wait to try them with my kids. I'm very impressed w/your hubby! Yummo that looks so delicious! 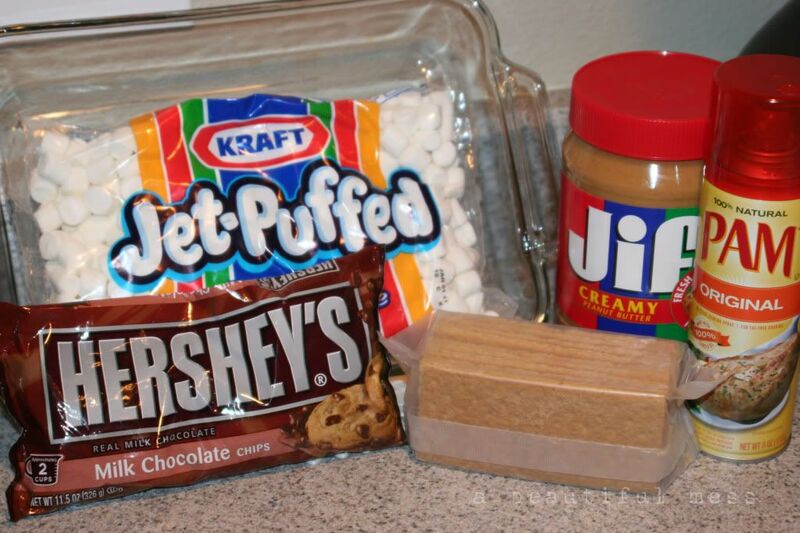 I've never had smores before... might have to try this!! What book did your book club read? We are in the middle of "The Book Theif". These look delish! What a fun daddy to make them. And your kids are adorable! These do look yummy! But I use the oven to make "regular" s'mores. Just lay graham crackers on the cookie sheet, add a square of chocolate to each one, and top it off with one marshmallow. Bake in a 200 degree oven for a bit (maybe 5 minutes?) until the chocolate melts and the marshmallow is soft. Remove from oven. Smoosh each marshmallow with a piece of graham cracker. And there you have it -- s'mores for when there's no fire to be found.